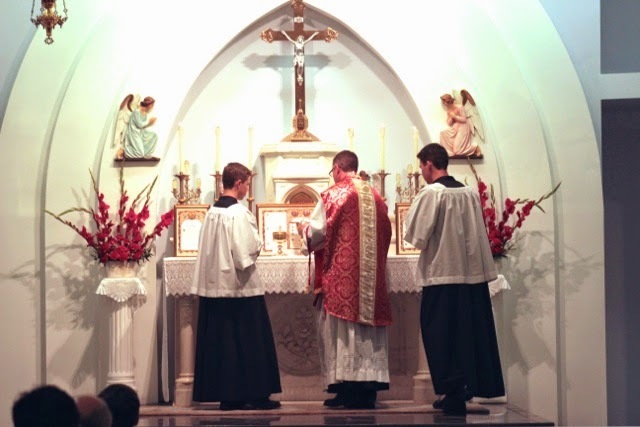 After Pope Emeritus Benedict XVI issued his Motu Proprio, Summorum Pontificum, on July 7, 2007, establishing that every priest could offer the Traditional Latin Mass, a group of faithful from Huntsville, Alabama and surrounding areas expressed a great desire for the Traditional Latin Mass. 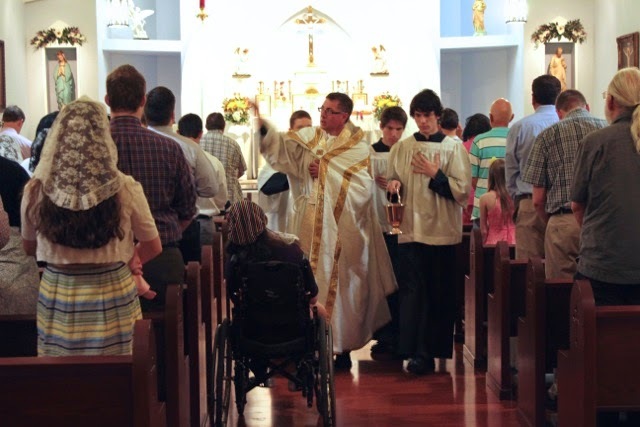 In 2008, in response to the faithful desiring the Traditional Latin Mass, Bishop Robert Baker (Birmingham, Alabama) established an apostolate in Huntsville, Alabama in order to make this Mass available. Father Alan C. Mackey was appointed chaplain of the newly formed Latin Mass community in Huntsville with the assignment of offering the Holy Sacrifice of the Mass and making the Sacraments available according to the 1962 liturgical books. The newly formed Latin Mass Community was granted permission to use the facilities of an existing parish, St. Mary of the Visitation in Huntsville, for Sunday Mass. The community steadily increased in support and number, and a building fund was established and maintained with the goal of purchasing property for the establishment of a personal parish. Five years after first expressing a desire for the Traditional Latin Mass, the vision of Father Mackey and the community of faithful came to fruition with the purchase of an Anglican Church in the Five Points district of Huntsville. Providentially, the first Mass in the new building was offered on January 31, 2013, the Feast of St. John Bosco, who had a special devotion to Our Lady under the title, Help of Christians. On the 4th Sunday of Lent, March 10, 2013, after years of prayer and hard work by many faithful, along with generous donations, the newly formed Catholic Church was officially dedicated as a personal parish within the Diocese of Birmingham. Bishop Robert Baker, using the 1962 Dedication of a Church Rite, dedicated the building at 1201 Kingsbury Avenue, Huntsville, Alabama, and established Our Lady, Help of Christians in Huntsville, Alabama as a diocesan Traditional Latin Mass parish. Immediately following the Dedication, Father Mackey, whom Bishop Baker appointed pastor to Our Lady, Help of Christians, offered a High Mass. Due to the Virgin Mary’s constant intercession and maternal protection, the parish chose the name: Our Lady, Help of Christians, a title given to Our Lady by Pope St. Pius V after the Christians’ naval victory over the Muslim fleet at the Battle of Lepanto on October 7, 1571. The Traditional Latin Mass, offered according to the 1962 books, is now available regularly to those in the Huntsville and surrounding areas. Every Sunday there are two Mass options: Low Mass at 7:00 am, and a High Mass at 12:00 pm (preceded by the recitation of the Rosary.) Mass is offered on all Holy Days of Obligation, and regular weekday Mass is offered on Mondays, Wednesdays, Fridays and Saturdays (with First Saturday Devotions led by Father Mackey.) With great devotion to the Most Blessed Sacrament, the parish spends one day each month in Adoration of the Most Blessed Sacrament. The parish enjoys the rich blessings offered through the 1962 calendar such as parish processions, rich Sacramental celebrations, and traditional observation of the liturgical calendar on Ember days and beautiful Feasts of the church. In the year since the dedication of the parish, membership has grown steadily. Parish life has also grown with a focal point of renewing Catholic Culture in and through the parish. There are occasional festivals and receptions anchored to beautiful Feasts of the Church. Classes for adults are offered as well as classes for children preparing to receive Sacraments. A parish Altar and Rosary society has formed and through the work of generous volunteers maintains the beautiful interior of the Church. The church maintains a St. Vincent de Paul outreach to the local community, and is involved in vibrant Pro-life work. Our Lady, Help of Christians parish, in looking to the future and under the leadership of Father Alan Mackey, continues to identify and pursue a number of building projects to improve the interior and exterior church grounds. Our Lady, Help of Christians Traditional Latin Mass parish maintains a website with pertinent and up to date information. You can access that site by clicking here. Don’t forget to check out Mrs. Mackintosh’s blog here. Looks like it’s rich with helpful things for moms who homeschool.